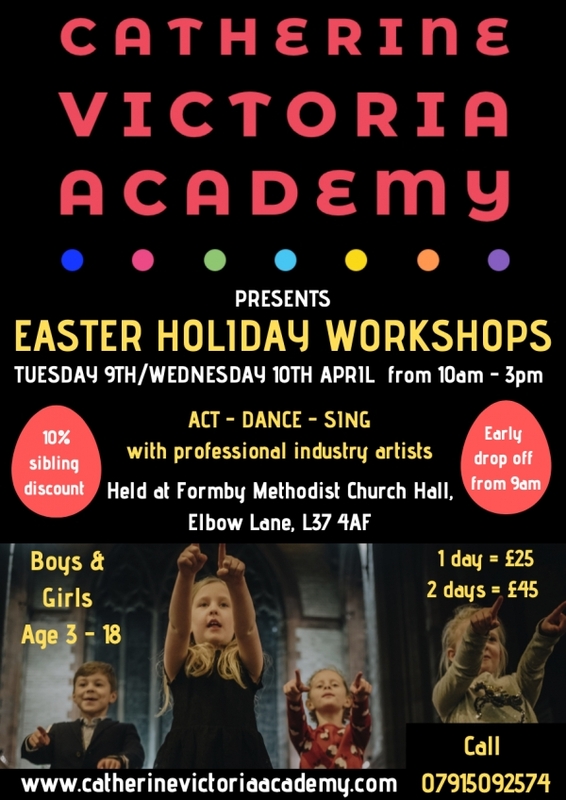 During the school holidays, the academy opens its doors to all children who are looking for days of fun and games and a chance to work with professional performers from the performing arts industry in the disciplines of drama, dance and singing. It is also an ideal opportunity to experience life at our academy and meet new friends! To register for our next workshop please fill in the registration form as soon as possible to guarantee a place. We will be covering the 3 disciplines of dance, drama and singing as well as having lots of fun and games. More infomation about clothing and mealtimes will be provided upon registration. Children aged 3 - 4 can have the option to go home at lunchtime (12.30pm) and will pay half price fees! 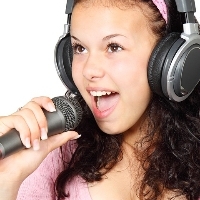 The Catherine Victoria Academy is based in Formby offering individual and group tuition for singing, piano and music theory. To register please go to the website or call Catherine Victoria Whitehall on 07915092574. These Terms were last updated on 30th June 2016. These Terms constitute a binding legal agreement between "you" (the user) and “us” (Interests Media Ltd of www.interests.me, together with affiliated websites and applications, trading as and referred here as “interests.me”, a company registered in England at Tiverton, South Road, Woking, GU21 4JS, United Kingdom and company number 8908109). "You" (the user) may be a visitor to our website, without creating a personal account on interests.me, or you may be a personal account holder, having either created your personal account by entering your email address and choosing a password, or accepted an email invitation to join an organisation as a team member, and chosen a password. These Terms relate to our relationship with you the individual user, not with any organisation you represent or belong to, and we hold individual users personally responsible for their actions in using interests.me. An organisation may enter into a separate Contract for Services with interests.me, which does not negate these Terms. If you are a visitor to our website, and you decide to subscribe to an email newsletter provided by one of the organisations using interests.me, or an automated email newsletter for a community, you are not deemed to be a personal account holder unless you have also associated yourself with an organisation and created a password. If you subscribe to an email newsletter provided by one of the organisations using interests.me, you agree that your relationship as an email subscriber is with that organisation, and that you will hold that organisation responsible for any unwanted or inappropriate emails you receive from them. You will always have the opportunity to unusubscribe from any email newsletter sent using the interests.me tool, using an unsubscribe link at the bottom of the email, so please do use this facility if there are any email newslettesr you are unhappy to be receiving. Nothing in the Terms shall confer or purport to confer on any other third party, any benefit or the right to enforce any term of the Terms, and the Contracts (Rights of Third Parties) Act 1999 shall not apply to the Terms. These Terms and any dispute or claim arising out of or in connection with them or the subject matter (including non-contractual disputes or claims) shall be are governed by and construed in accordance with English law. No failure or delay by us in exercising any right, power or privilege under the Terms shall operate as a waiver of such right or acceptance of any variation of the Terms and nor shall any single or partial exercise by either party of any right, power or privilege preclude any further exercise of that right or the exercise of any other right, power or privilege. If there is a discrepancy between this English language version and any translated copies, the English version shall prevail. Nothing in these Terms limits or excludes our liability for death or personal injury caused by proven negligence, or any liability which cannot be limited or excluded by law. We reserve the right to modify, amend or change the Terms at any time (a “Change”). If we do this then the Changes will be posted on this page and we will indicate the effective date of the updates at the top of the Terms. In certain circumstances, we may send an email to you notifying you of any Change. You should regularly check this page to take notice of any Changes. If you do not accept any Change to the Terms, you should stop using interests.me immediately. Your continued use of interests.me following any Change constitutes your acceptance of the Change and you will be legally bound by the new updated Terms. If, for any reason, any of the Terms are declared to be illegal, invalid or otherwise unenforceable by a court of a competent jurisdiction, then to the extent that term is illegal, invalid or unenforceable, it shall be severed and deleted from the Terms and the remainder of the Terms shall survive, remain in full force and effect and continue to be binding and enforceable. The Terms set out the entire agreement and understanding between us and you in relation to your use of interests.me and this document supersedes all previous agreements, representations and arrangements between us (either oral or written). Nothing in this clause shall limit or exclude any liability for fraudulent misrepresentation. You may use interests.me, provided that you warrant that you are 13 years of age or over, and that you have the right, authority and capacity to enter into and be bound by the Terms and that by using interests.me you will not be violating any law or regulation of the country in which you are resident. You are solely responsible for your compliance with all applicable local laws and regulations. Organisations with a record of terrorist or violent criminal activity are not invited to join interests.me. If we have told you, for whatever reason, that you or your organisation may not use interests.me, or if we have disabled your personal account, you will not create another personal account without our permission. This section deals with how we expect you to behave when using interests.me and in particular when creating "Content" (any contribution you make to the website or send as part of an email newsletter including stories, messages, email subject titles, organisation names, photographs, images and any other content). You agree that you will only use interests.me in a manner consistent with its purpose, which is as a collaborative email newsletter tool and related website which is intended as a safe and friendly environment in which to share information within an organisation, between organisations, and with the general public. You agree, in your use of organisation name, organisation description, and ‘from’ email address, not to represent yourself on interests.me as anyone or anything you are not, in particular in order to bring those persons or organisations into disrepute. You agree that you will not create a personal account for anyone other than yourself or an organisational account for an organisation you’re not associated with, without their express permission. By creating an organisational account you warrant that you have permission to represent that organisation and communicate on its behalf. You agree not to spam individuals by sending unwanted emails, or adding any individual’s email address to a mailing list without their express permission to receive email from your organisation. You agree not to our websites by repeatedly posting the same or very similar Content, and you agree not to spam individuals by emailing the same or very similar Content repeatedly to the same individual. You agree in all your uses of interests.me not to use expletives or language which could be deemed offensive or is likely to harass, upset, embarrass, alarm or annoy any other person, except in the course of normal rational and respectful debate and discussion. You agree not to post or email Content which is obscene, pornographic or is likely otherwise to offend human dignity. You agree not to post or email defamatory Content. You agree that you will not post Content which contains any spy ware, adware, viruses, corrupt files, worm programmes or other malicious code designed to interrupt, damage or limit the functionality of or disrupt any software, hardware, telecommunications, networks, servers or other equipment, Trojan horse or any other material designed to damage, interfere with, wrongly intercept or expropriate any data or personal information whether from interests.me or otherwise, or itself, or the posting of which, infringes any third party’s rights (including, without limitation, intellectual property rights and privacy rights). You agree to only use other interests.me users' personal information including their email addresses and whatever they may post to interests.me to the extent that your use of it matches interests.me's purpose of allowing people to receive communications and Content from your organisation and to share Content between organsiations and with the general public. You agree not to create Content for emails or post Content on the website that has been written by or belongs to someone else without their express permission, and if you do, you agree to take full responsibility for it and any subsequent sharing of it by other organisations using interests.me. If Content has been made public on the interests.me website by another organisation, it is permissible for you to share it within your interests.me emails on an ‘as is’ basis, and leaving in place any attributions attached to the Content, and it is permissible to link to it from elsewhere (for instance from other social media) but it is not permitted to copy and share it elsewhere (for instance on other social media) without permission. You agree that you will not use any Content in any manner which may infringe any third party’s rights. In particular you agree that you will not modify, adapt, distribute, publish or sell to anyone else all or any part of the interests.me site or the Content contained on it (other than the Content submitted by you). You agree that you will not solicit login information or access a personal account belonging to someone else. You agree that you will not collect users' Content or information, or otherwise access interests.me using automated means (such as harvesting bots, robots, spiders, or scrapers) without our prior permission. You agree not to post any Content or use any Content in your emails which is personally abusive, insulting or threatening, or which promotes or encourages racism, sexism, hatred or bigotry, either towards an individual or a group of people. You agree that you will not use others' information acquired through interests.me to spam, harass or make threats to them whether on the interests.me service or elsewhere. You agree that you will not post any Content or use any Content in your emails that obstructs, or gets in the way of the course of justice, for instance mentioning previous convictions of anyone on trial, posting photos, audio or video from inside a court room, creating a substantial risk of serious prejudice, or not respecting protected identities. You agree not to engage in or encourage any illegal activity using interests.me, including, without limitation, terrorism, abuse, or inciting racial hatred. You agree not to post any Content the submission of which in itself constitutes committing a criminal offence. You agree not to promote, plan or celebrate any actions which have resulted, or could result, in financial or physical harm to others including theft, vandalism, violence and terrorism. You agree that you will not engage in unlawful multi-level marketing, such as a pyramid scheme, on interests.me. You agree not to promote or encourage self-mutilation, eating disorders, hard drug abuse or suicide. You agree that you will not post Content which is age inappropriate to mailing lists targeted at users within a vulnerable age group. If you become aware of published or emailed Content which you believe breaks the law or breaches our Code of Conduct, you agree to forward th email or a link to the relevant webpage to complaints@interests.me. Our team will take a view on whether the personal account holder responsible will be warned or removed from interests.me, and whether police should be notified. You may of course notify the police yourself, but we ask that you also notify us. You agree to take responsibility for any personal information you choose to reveal to others about yourself to other users, whether via email or otherwise. Revealing any such information is at your own risk. We encourage you to use the same caution in disclosing details about yourself to third parties online as you would under any other circumstances. You agree to keep your password safe and take reasonable measures to prevent loss of privacy. You are responsible for everything you post, upload and say on interests.me. You are solely responsible for, and bear all liability in relation to, Content added by you. In addition, if you email Content 'as is' which has been created by someone else, you may be held responsible in law for the consequences of sharing that Content with your email subscribers, for instance if that Content promotes self-harm, is bullying or harassing, incites violence or otherwise breaks the law or our Code of Conduct. You agree that you alone are responsible for making all the necessary arrangements to ensure you can access interests.me (including, but not limited to Internet provider and mobile internet provider fees and, any other charges associated with such access). You give permission for Content that you have made publicly available to be used in other organisations' email newsletters ('as is' and with attribution to your organisation) and to be published on the interests.me website. You agree that in the event of a claim, that is if we are sued as a result of your use of interests.me, and if we choose to defend or settle the relevant claim as we see fit, you will co-operate fully and reasonably as required by us in the defence of any relevant claim, waiving any claims to anonymity or privacy. You own the Content you post, provided you are the rightful owner in the first place. In other words, if you write original Content or upload your own original images, you continue to own the copyright to that Content. You represent and warrant to us by posting Content on interests.me that you have the right to do so, and that you are an exclusive author and owner of the Content, or that you own all rights to its use. For Content that is covered by intellectual property rights ("IP Content"), and which you have made publicly available more widely than your own mailing lists, you specifically grant us a non-exclusive, transferable, royalty-free, perpetual, worldwide licence ("IP Licence") to use any IP Content that you post on interests.me. We need to be granted this IP Licence in order to publish your Content on our website. This IP Licence extends only to our use of the IP Content on the interests.me service. If you choose to make publicly available Content which you create, we reserve the right to share this Content freely on public and private pages of our website, and in automated emails produced by the interests.me service. You agree that other organisations are allowed to share this Content with attribution to your organisation, in their email newsletters. If you subsequently make Content private which was previously publicly available, we cannot be held responsible for email newsletters already sent containing your Content, as these are non retrievable. We reserve the right, if we see or someone alerts us that you have posted some Content to interests.me (either for emailing or publicly available) that we think is inappropriate, duplicative, or where we perceive a risk of physical harm or a threat to public safety, to remove it at our own discretion. We reserve the right to remove or reclaim any URL or organisation name if we believe it is appropriate to do so, such as when a trademark owner complains about a name that does not closely relate to a user's or an organisation's actual name, or if there is potential for confusion with another organisation, or when an organisation name is being used inappropriately, without permission or so as to deliberately create confusion. If we deem you to be associated with a criminal, terrorist or violent organisation, we may suspend or terminate your personal account without any other reason. We reserve the right to suspend, withdraw, amend, modify or vary the service provided on interests.me without notice and without incurring any liability to you. We own, control and license the copyright, trademark and intellectual property law rights of all text, graphics, user interfaces, trademarks, logos, sounds and artwork on interests.me which do not fall into the category of Content. You agree not to use our copyrights, trademarks or trading names (including Interests and interests.me), or any confusingly similar marks, except with our prior written permission. We reserve the right, if we are sued or subject to any claim as a result of your use of interests.me, to defend, settle, compromise and pay any and all claims or causes of action which are brought against us as we see fit and without your prior consent. We reserve the right at our sole discretion, at any time and without liability or the need to give you prior notice, to make use of any operational, technological, legal, or other means available to enforce the Terms (including without limitation blocking specific IP addresses). We are not responsible for proactively monitoring all Content on interests.me. We are not responsible for anything that you post, upload or say while you are using interests.me. We expressly disclaim any and all responsibility and liability for your conduct or the conduct of any other user of interests.me, and expressly disclaim any liability for Content created or uploaded by you or by any other user. We do not give any warranty about the quality, accuracy, functionality, availability or performance of interests.me, which is provided on an "as is" basis. We shall not be held responsible for any reduced functionality you may encounter as result of or in connection with accessing interests.me through mobile services or any similar service currently known or developed in the future. We shall not under any circumstances be liable for any service provider or access charges incurred by you in accessing the site. To the fullest extent permitted by law, we expressly exclude: all conditions, representations, warranties and other terms which might otherwise be implied by statute, common law or the law of equity; and any liability incurred by you arising from use of interests.me, its services or these terms and conditions, including without limitation for any claims, charges, demands, damages, liabilities, losses or expenses of whatever nature and howsoever direct, indirect, incidental, special, exemplary, punitive or consequential damages (however arising including negligence), loss of use, loss of data, loss caused by a computer or electronic virus, loss of income or profit, loss of or damage to property, wasted management or office time, breach of contract or claims of third parties or other losses of any kind or character, even if we have been advised of the possibility of such damages or losses, arising out of or in connection with the use of interests.me. This limitation on liability applies to, but is not limited to, the transmission of any disabling device or virus that may infect your equipment, failure or mechanical or electrical equipment or communication lines, telephone or other interconnect problems (e.g., you cannot access your internet service provider), unauthorized access, theft, bodily injury, property damage, operator errors, strikes or other labor problems or any act of god in connection with interests.me including, without limitation, any liability for loss of revenue or income, loss of profits or contracts, loss of business, loss of anticipated savings, loss of goodwill, loss of data, wasted management or office time and any other loss or damage of any kind, however arising and whether caused by tort (including, but not limited to, negligence), breach of contract or otherwise, even if foreseeable whether arising directly or indirectly. We have taken reasonable steps to ensure the currency, availability, correctness and completeness of the information contained on Interests and we provide that information on an "as is", "as available" basis. We do not give or make any warranty or representation of any kind about the information contained on interests.me, whether express or implied. Use of interests.me and the materials available on it is at your sole risk. We cannot be held responsible for any loss arising from the transmission, use of data, or inaccurate Content posted by users. You are responsible for taking all necessary precautions to ensure that any material you may obtain from interests.me is free of viruses or other harmful components. You accept that interests.me will not be provided uninterrupted or error free, that defects may not be corrected or that interests.me, or the server that makes it available, are free of viruses or bugs, spyware, Trojan horses or any similar malicious software. We are not responsible for any damage to your computer hardware, computer software, or other equipment or technology including, but without limitation damage from any security breach or from any virus, bugs, tampering, fraud, error, omission, interruption, defect, delay in operation or transmission, computer line or network failure or any other technical or other malfunction. You agree to hold harmless and indemnify us and our officers, directors, employees, agents, representatives and licensors from and against any third party claims, damages (actual and/or consequential), actions, proceedings, demands, losses, liabilities, costs and expenses (including reasonable solicitor’s fees) suffered or reasonably incurred by us arising as a result of, or in connection with, your access to and use of interests.me, the uploading or submission of Content to interests.me by you or your conduct, other than in accordance with the Terms or any applicable law or regulation. When registering on our site, you may be asked to enter personal information including your name and your e-mail address. We may also collect IP address information and link this to your personal information. During the course of registering, associating yourself with any organisations, categorising organisations, specifying preferences, and creating and posting Content, you may reveal information to us about your preferences and interests, which may include or imply (at your sole discretion) other personal details, family details, lifestyle and social circumstances, information about goods and services bought, financial information, employment and education details, and other personal interests and preferences. You may (at your sole discretion) choose to reveal to us sensitive classes of information such as physical or mental health details, racial or ethnic origin, religious or other beliefs, trade union membership, sexual life, or offences and alleged offences. In order to provide our service, information about which mailing lists or organisations you join, or create or are active within, will be linked to your personal information in our systems, although the visibility of this information internally is carefully controlled (see section 3 below - Visibility of Your Data). During the course of using our website, you may reveal information about yourself to other users. We recommend that you think carefully about the information you disclose about yourself. We do not recommend that you put email addresses, phone numbers, full names or addresses, credit card details, national identity numbers, drivers’ licence details and other sensitive information in any messages or Content on the site. When you post, upload or email information about yourself, the amount of personal information you share is entirely at your own risk. Information about your subscription to mailing lists or your involvement in organisations including (but not limited to) how often you access interests.me, or how often you post Content, is collected and linked to your personal information in our systems in order to provide a better service and also to make decisions about the removal of Content or users in the event of complaints or disputes. Again the visibility of this information internally is carefully controlled (see below - Who sees what about you?). You may visit our site anonymously without registering a personal account. If you do so, we will not collect any personal information, however we may place session ID cookies on your computer, and we may collect IP address information to better understand site traffic and user locations. When you subscribe to an organisation's mailing list, the organisation's administrator(s) will see your name (if given) and your email address. They may be able to see whether you have opened emails they send to you. If you wish to unsubscribe from their mailing list, you may do so by clicking the 'unsubscribe' link at the bottom of every email you receive from that organisation. Fellow members of the same mailing list will not see your membership of that list or any other mailing lists. If, as a personal account holder, you create an organisation, or if ownership of an organisation is transferred to you, and if that organisation applies to join a 'community' on interests.me (a cluster of organisations), you agree that your email address may be shared with the administrator(s) of that 'community'. You will automatically be added to a mailing list for that 'community'. If you no longer wish to receive emails from that community's administrator(s), you may unsubscribe from their emails in the usual way. We use your personal information and information about your membership of, creation of, or activity within mailing lists or organisations, to enable us to provide a relevant and rich targeted service for you our users, and in particular to suggest relevant other content or mailing lists based on your interests. To improve our website and tools (we continually strive to improve our website and tools based on the information and feedback we receive from you). To send email notifications of new mailing lists, organisations or Content. To send periodic emails. The email address you provide during registration may be used to send you information and updates pertaining to your membership of specific discussion forums or of interests.me in general, in addition to receiving occasional company news, updates, related service information, etc. Note: If at any time you would like to unsubscribe from receiving future service-related emails, we include detailed unsubscribe instructions at the bottom of each email. We use a secure server. All supplied sensitive/credit information is transmitted via Secure Socket Layer (SSL) technology and then encrypted into our database to be only accessed by those authorized with special access rights to our systems, who are required to keep the information confidential. Visibility of your personal information is limited to a very small number of employees of interests.me who adhere to a strict code of conduct on privacy. While we take reasonable precautions against possible security breaches of our website, member database and records, no website or Internet transmission is completely secure and we cannot guarantee that unauthorised access, hacking, data loss, or other breaches will never occur. We urge you to take steps to keep your personal information safe (including your password) and to log out of your personal account after use. If you share your password or leave your logged-in interests.me personal account unattended, your personal information or privacy may be compromised. If that happens, please report it at help@interests.me. You must, if possible, change your password immediately. You can do this by clicking on the 'forgotten password' link on any sign-in page and following the instructions to create a new password. interests.me cannot be held responsible for your failure to keep your password secure. In addition, whilst once we have received your information we have procedures and security features in place to prevent unauthorised access, we cannot guarantee the security of your personal data while it is being transmitted to our site and any transmission is at your own risk. If you leave our service, your personal information (name and email address) will be kept on file for more than 60 days in order to continue providing a service should you rejoin our service. For instance our system will record that you have previously unsubscribed from a mailing list, so that you cannot be resubscribed by the organisation. If you leave our service, Content you have created for an organisation will remain for other team members of the same organisation to use. If you wish to prevent Content you have created being used by an organisation, please delete it before leaving our service. When we believe release is essential to comply with the law, enforce our site policies, or protect ours or others' rights, property, or safety. Where necessary or required, we will share personal information with law enforcement authorities as they request by warrant, with courts of law in defence of a claim, with governments, or with a third party who is claiming that any Content posted or uploaded by you to our site constitutes a violation of their intellectual property rights or of their right to privacy or any other law. In accordance with the above, it may sometimes be necessary to transfer personal information overseas. When this is needed information may be transferred to countries or territories around the world. Any transfers made will be in full compliance with all aspects of the UK's Data Protection Act. Non-personally identifiable visitor or user information may be provided to other parties for marketing, advertising, or other uses. One of the ways in which we collect information is by placing cookies on your device. Cookies are small text files that a site or its service provider transfers to your device's hard drive through your web browser (if you allow) that enable the site's or service provider's systems to recognize your browser and capture and remember certain information. Third party cookies: These may be used to improve functionality, for instance if you request social plugins, links to other social platforms or the viewing of videos. You may set your browser and your mobile settings to block cookies and local storage devices, but if you do so, you may not be able to access the full set of features that interests.me offers. Because we value your privacy we have taken the necessary precautions to be in compliance with the California Online Privacy Protection Act. We therefore will not distribute your personal information to outside parties without your consent. As part of the California Online Privacy Protection Act, all personal account holders may make any changes to their information at any time by visiting their 'Settings' page. In compliance with the requirements of COPPA (Childrens Online Privacy Protection Act), we do not collect any information from anyone under 13 years of age. Our service is directed only to people who are at least 13 years old or older. Our full Data Protection Policy, in addition to covering how we process information about users of our service, also covers how we process information about suppliers, employees, advisers and consultants.